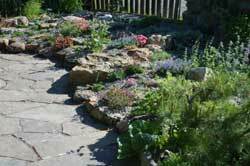 Our garden here at Vale’s Greenhouse is an Alpine Rockery and contains plants that you would find growing among rocks in the mountains. An alpine plant, strictly defied, is a plant that is native to mountain heights above the timberline in sub-alpine and alpine zones. The original word “alpine” is connected with the Alps, the grand mountain range that extends from France into Switzerland and Italy. Every continent in the world has Alpine regions and plants from above the timberline in these other regions are also known as Alpines. 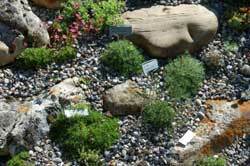 Casual usage has led the word “alpine” to be interchanged with “rock garden plant” thus many rock garden plants are not alpines. 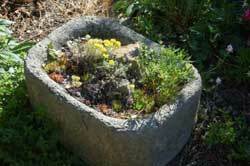 However because plants from the alpine regions grow low with a cushion habit and in miniaturized proportions, they can be confused with classic rock garden plants. 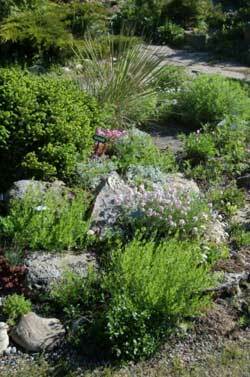 Furthermore, a large number of plants that grow below the tree line are just as attractive and as suitable for growing in an alpine or rock garden as the true alpines; even though some can be fairly tall it is generally accepted that to be classed as an alpine, the plant should be no taller that 10 inches. 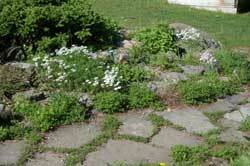 This allows you to be able to fit hundreds of plants into a space that would fit only a dozen traditional perennials. (Are you confused yet)? 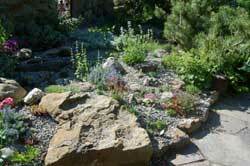 When giving tours of the rockery Katrina often has to explain what make a classic alpine garden, and how each plant is placed to make the most of the overall effect, in the garden. 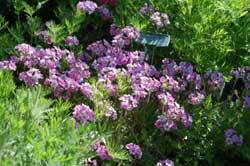 When alpine plants bloom each flower is relatively large compared to the diminutive overall size of the plant. Some say this is so they attract pollinating insects. This seems a good explanation as at the higher elevations perhaps bees are few and far between. This small section of the garden at Vale’s Greenhouse, is on the right hand side of the garden when you first enter the garden area, and was created about 1994. Since that time it has been developed and worked on every year . 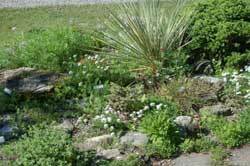 Many true alpine plants are surprisingly easy to cultivate in the rockery and so Katrina has to spend time each spring and summer keeping the more aggressive plants in check. The love and appreciation of alpines is very personal for Katrina, and she can be often found in the alpine garden fussing over deer damage, weeds and general maintenance that is required to keep the garden looking great. 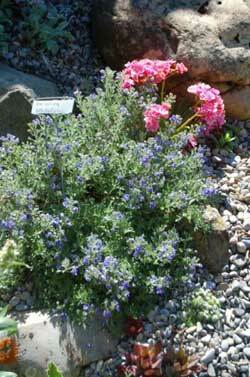 Rock Garden Plants may appear to be dainty and delicate but they have adapted to withstand poor, rocky soil, extremes of weather, including high winds, and deep snow and summer drought. Their environment has shaped their size and habit - this makes these plants perfect for gardens in the Southern Alberta area.